Mix all the other ingredients in a bowl. (You can leave the mixture in the fridge for 1-2 hours for ground meat to absorb the flavors of the spices). With a spatula spread a thin layer of the mixture evenly on the tortillas. Preheat the oven to 375 F (190 C) and place 1-2 tortillas with ground beef on a tray and place it on the third rack from the top. Turn the oven to broil (grill) and broil for 2-3 minutes. Make sure not to burn the edges of tortillas. Place the broiled tortillas with ground beef in a large pot on top of each other and close the lid. So, they will stay warm and also soft. The traditional serving style of the Tortillas with Ground Beef is: Squeeze some lemon and place some kebab salad and onion salad inside then, roll it up. Serve warm with ayran. Butun malzemeleri bir kasede karistirin. (Baharatlarin kiyma ile butunlesmesi icin 1-2 saat buzdolabinda bekletebilirsiniz). Tortillalarin uzerine spatula yardimi ile kiyma harcini ince tabaka halinde yayin. Firini 190 C (375 F) ye isitin ve ustten ucuncu rafa firin tepsisine 1-2 lahmacun koyun ve ustten kizartma (broil) ayarinda 2-3 dakika kizartin. Kenarlarini yakmamaya dikkat edin. Hazir olan lahmacunlari bir tencereye ust uste koyarak tencerenin kapagini kapatin. Boylece lahmacunlar hem sicak kalacak, hem de yumusacik olacaklar. Lahmacunun geleneksel servis sekli; icine limon sikilarak ve kebap salatasi ve sogan salatasi koyulup, rulo yapilarak ayran ile sunulur. This recipe is delicious but do you know how to make the real lahmacun bread instead of tortilla's? 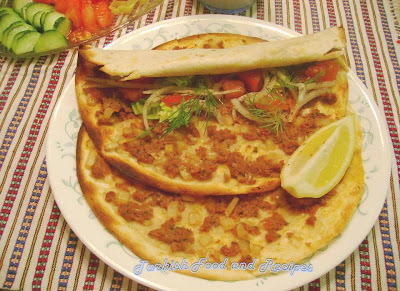 You may use this recipe http://www.turkishfoodandrecipes.com/2009/01/bread-rolls-with-cheese-lorlu-ekmek.html to make a lahmacun dough. And this will make approximately 24-25 lahmacuns. So maybe you can just use the half of the ingredients to obtain a smaller dough. Just follow the instructions for " bread rolls with cheese" to make the dough. After fermentation, divide the dough into egg size or bigger pieces and flatten each piece to form a lahmacun. Then spread the mixture over and follow the cooking instructions in the lahmacun recipe. I hope you'll be satisfied, and you'll taste the real authentic lahmacun by making the lahmacun bread yourself. Good luck! Also let me know about the result.